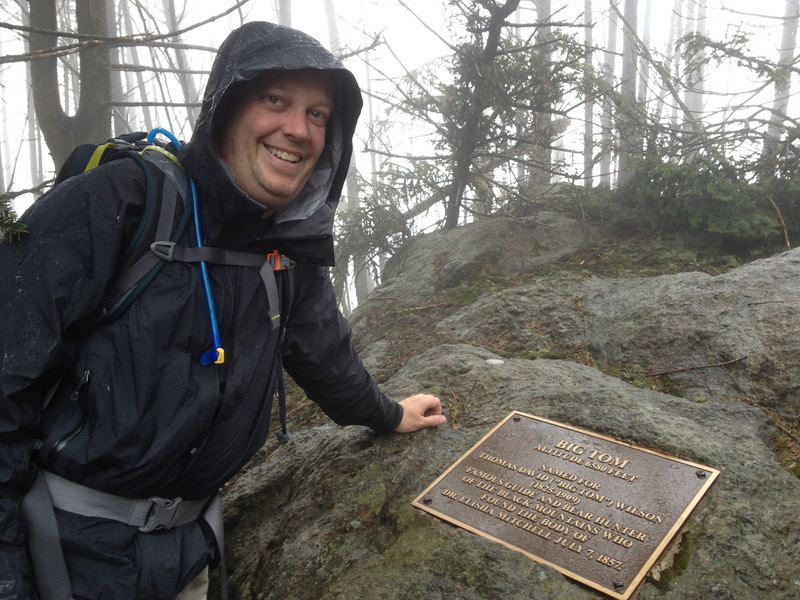 On April 27, 2013 myself and 6 others went for the summit of Mount Mitchell, NC, highest point east of the Mississippi in North America at 6684′. I was joined by Ashton, Tomas, Amy, Janice and her dog Niki, David B. and Omar. We started our 9.2 mile hike from the campsite at Carolina Hemlocks Recreation Area marked by map pin #1 (see map below). 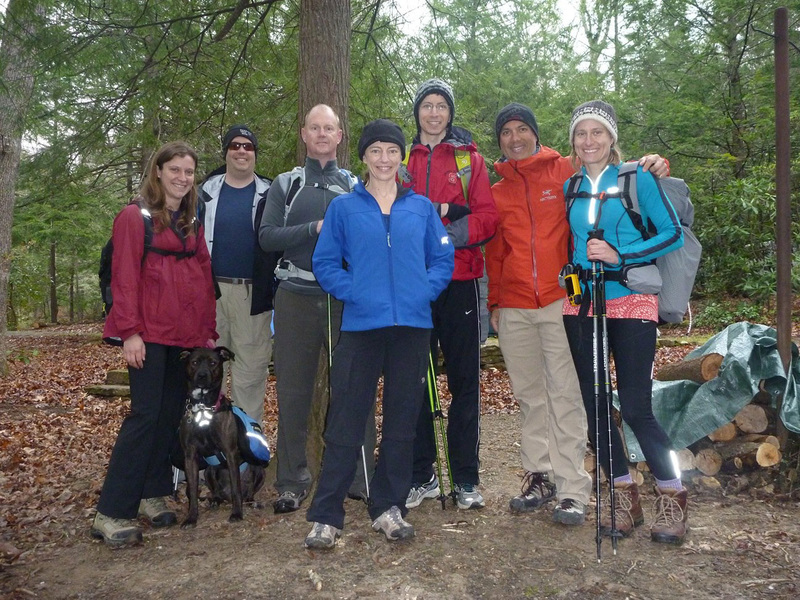 It was cloudy and cool, probably around 45 degrees F.
Hiking group at camp before hitting the trail. (from left to right: Janice, Niki (dog), me, David B., Amy, Omar, Tomas, Ashton) Photo by Ashton. Our hike began following a trail out of the campsite along the South Toe River out to the NC 80 road bridge, across the bridge and left up Colbert’s Creek Rd. to the trailhead for the Colbert Ridge Trail. From here the ascent began at 8:17AM. It is 3.8 miles up 3000′ to the top of the ridge. This is truly an unforgiving upward hike. We stopped numerous times in the lower portion stripping off layers to stay cool. Unfortunately the humidity was really high, so our sweat was not evaporating quickly. This causes us some discomfort up on the Crest Trail later in the day when the showers start. The only decent long range view we had was about 1/3 of the way up Colbert Ridge (unmarked map pin in map below). View to the north part of the way up the Colbert Ridge Trail. This is probably the best long range view we had all day due to the clouds and rain. After 3 hours of hiking at what is considered a good pace (1000′ of elevation gain per hour) we made it to Deep Gap at the top of the Colbert Ridge Trail at 11:17AM at map pin #3 (see map below). After 10 minutes of so of resting and lots of photos taken by everyone, we got underway on the Black Mountain Crest Trail. By 12:08PM we made it to the 1st of 6 of the 6000’+ summits, Potato Hill at 6509′ at map pin #4 (see map below). One of our hikers was suffering from some cramps in his quads. He had not properly hydrated in preparation for the hike. We finally stopped for a quick lunch (15 minutes or less) since it was chilly on top of the ridge and as mentioned before, our base layers were a bit wet. The humidity was so high our sweat was not evaporating making body temperature regulation miserable. By 12:54PM we made it to the 2nd of 6 of the 6000’+ summits, Cattail Peak at 6583′ at map pin #5 (see map below). Cattail Peak summit at 6583′, the 2nd of 6 of the 6000’+ peaks on the Black Mountain Crest Trail. Not too long after we hit the 3rd of 6 of the 6000’+ summits. This one is unnamed at map pin #6 (see map below). At this point our hiker with the cramps needed additional hydration. I was originally given a little grief for packing 4.5L of water for the trek, but it came in handy. I was able to share 1L without worry. I did end up with 1.3L of water remaining by the end of the hike. Did I carry too much? Not in my opinion. By 1:31PM we made it to the Big Tom Spur Trail. This little trail would take you down to the Buncombe Horse Range Trail if you were heading that direction, but not us! Onward towards the next peak. By 1:55PM we made it to the Big Tom summit at 6580′, the 4th of 6 of the 6000’+ peaks at map pin #7 (see map below). Big Tom summit at 6580′, the 4th of 6 of the 6000’+ peaks on the Black Mountain Crest Trail. We were going through some really steep sections in this area. A couple places were protected by a rope to help you make your way up the trail (or down if you were going the other direction). I was feeling pretty good, though by now I had already decided this was a more difficult hike than my summit attempt on Mount St. Helens from just 2 weeks before; having far exceeded the total elevation gain heading for the Mount Mitchell summit than we had completed in the snowstorm on Mount St. Helens. 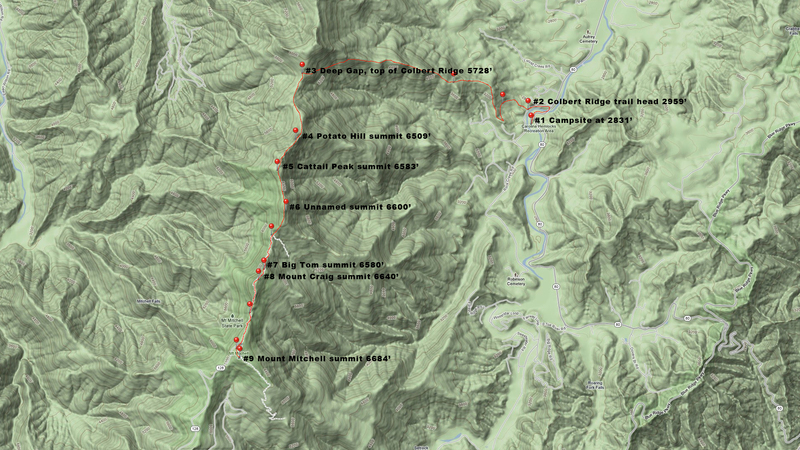 By 2:10PM we made it to the top of Mount Craig at 6640′, the 5th of 6 of the 6000′ peaks at map pin #8 (see map below). 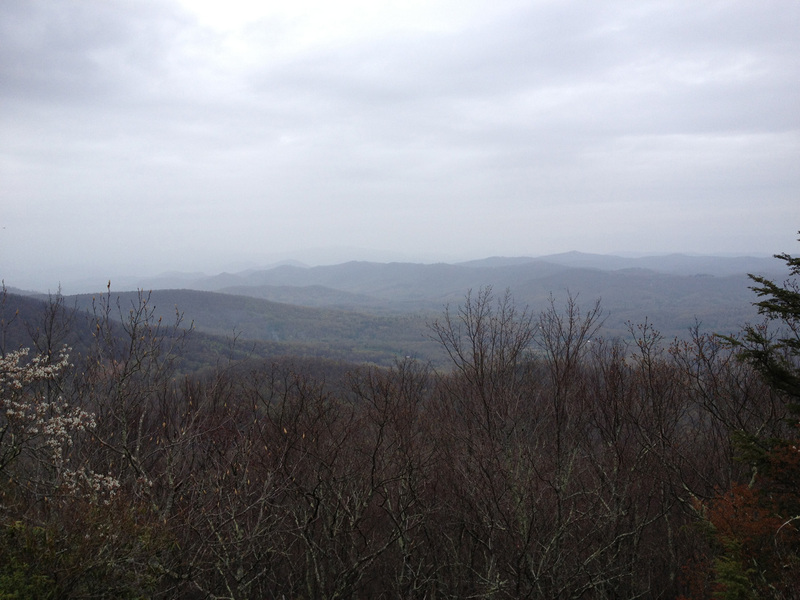 By about 2:30PM we made it to the low point between Mount Craig and Mount Mitchell! The group had spread out a bit as we got closer to our goal. 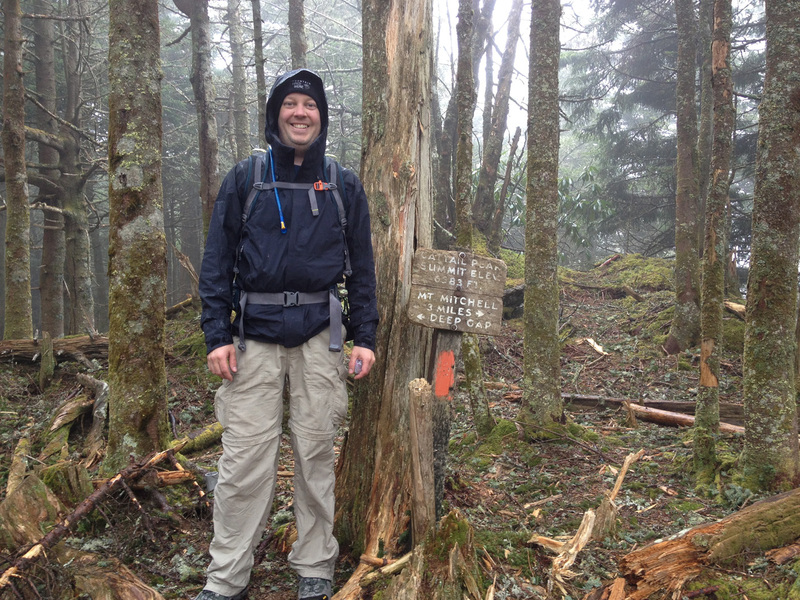 And, the closer we got to the Mount Mitchell summit, the rain showers were really set it. As we made it to the parking lot at the top, those of us who had gotten ahead waited for the others to catch up. We stood under the roof of the Museum and gift shop building and everyone made the last march to the summit. At 3PM we made the summit of Mount Mitchell at 6684′, the 6th and final of 6 of the 6000’+ peaks we crossed on this 9.2 mile trek at map pin #9 (see map below). 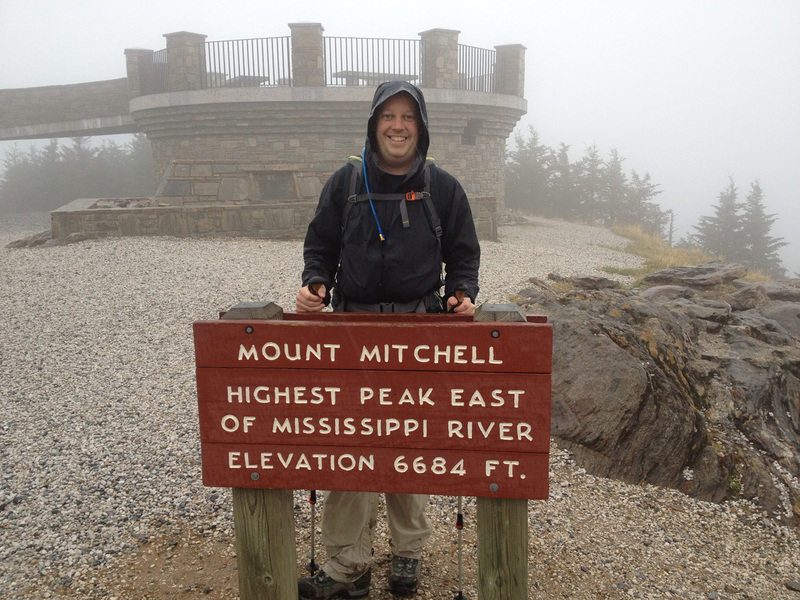 Mount Mitchell summit at 6684′!! This is the 6th of 6 of the 6000’+ peak we hit on the Black Mountain Crest Trail. Group at the summit of Mount Mitchell! (from left to right: Tomas, Janice, Niki (dog), Ashton, Omar, Amy, David B., me) Photo by Ashton. My path to the summit of Mount Mitchell, NC. From here, the original plan of the advanced hike would have taken us closer to a 16 mile day. We were supposed to follow the Black Mountain Crest Trail back to the Big Tom Spur Trail, down to the Buncombe Horse Range Trail and all the way back to camp. With the knowledge of how hard that last 1.5 miles was (steep terrain) the alternative was to take a 3 mile loop around, then still having the 6.2 miles of the Buncombe Trail and possibly another mile from the end of that trail at the base of the ridge back to the campground along the road. But, we already had a hiker with some leg cramps, the weather sucked so we were kind of miserable anyway and we weren’t sure we would have enough food energy and/or time to make it down the trail before dark. The additional mileage would have taken our full hike to around 18-20 miles, yikes! 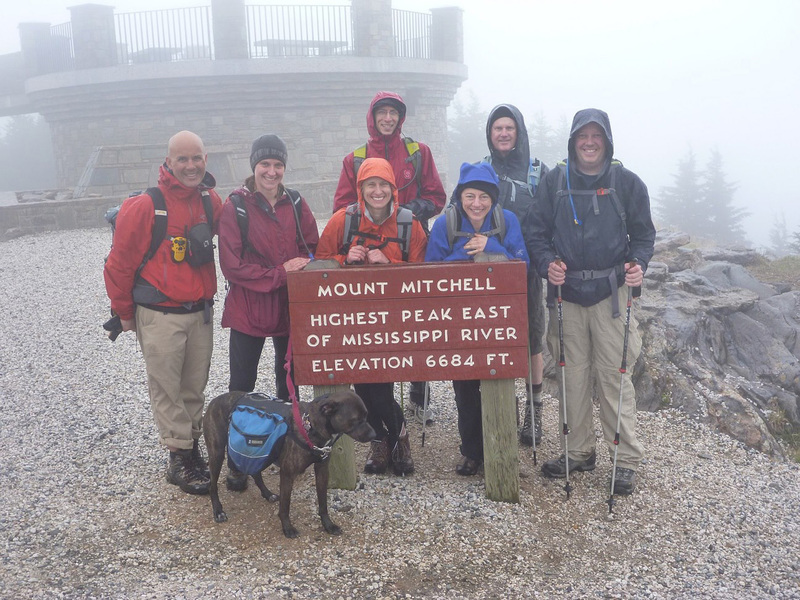 So, we made the tough call to stop hiking after making the Mount Mitchell summit. I made a call down to our campground office (thanks to Ashton for snapping a pic of the flyer at the start) and we got a ride back in Jerry’s minivan. It would take him about 40 minutes to drive up… and, it was 38 degrees F outside. While we waited, we huddled in the Museum (the Park Ranger was nice enough to lock us inside so we would be warm while we waited) and surprise, I carried Snickers bars up the mountain! Since we didn’t have anyone in our group who was camping but not hiking, someone had to follow through! Jerry soon arrived and we gave him lots of love and gas money. We pigged out at camp. It’s too bad the weather was crap, but it was a fun weekend with great company!